Concert with Tefkros Xydas (viola), George Georgiou (clarinet) & Mariola Charitidou (piano) at Technopolis 20 in Pafos. Tickets: 12 Euro with proceeds to the Paphos Music Lovers Association fund to support local arts projects. George Georgiou (clarinet) is hailed for his energetic and inspirational performances. The Cypriot clarinetist George Georgiou enjoys a career as a classical and contemporary clarinetist. He appeared in many solo concerts and recitals in Europe, Middle East and USA. He collaborated with some prominent musicians such as the legendary cellist Rohan de Saram, the Prazak Quartet, the Apple Hill String Quartet, the Chilingirian String Quartet, the violinist Movses Pogossian and he appeared as a soloist with the Commandaria Orchestra and Moscow Virtuosi. In his research for new repertoire, George started commissioning works for clarinet and so far, he collaborated with the most dominant composers from Cyprus. He premiered several works featuring the clarinet with most of them being dedicated to him. Since 2015, he is a faculty at the LeBAM Summer Academy. He is a member of Georgiou Georgieva Duo, Lyrical Noise Ensemble, Evohe Wind Quintet, Chronos Contemporary Music Ensemble and Claritar Duo as well as musician in residence at the Avaton Contemporary Music Festival (Cyprus). 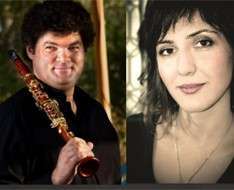 He holds the position of clarinet professor at the University of Nicosia. He is the artistic director of Music at the Museum Concert Series and the general director of CultureTones Organisation, a not for profit cultural organization based in Cyprus. George is a graduate from City University, London, where he studied clarinet with Julian Farrell and Joy Farel at the Guildhall School of Music and Drama. He is also a MBA graduate from the Neapolis University Paphos, Cyprus and a member of Mensa Cyprus. His busy profile gained him an international recognition and he became a Fratelli Patricola Clarinet Artist, a Silverstein Ligature Artist and a Marca Reeds Artist. He records for Hook Records. Tekros Xydas (viola) was born in Greece in 1985. At the age of six he moved to Cyprus where he began his musical training in violin with Pavlos Koukos. During his teenage years he took part in chamber music ensembles and was a member of the Cyprus Youth Orchestra where he gave concerts in Cyprus and Greece. In 2004 he received a scholarship to attend the annual chamber music seminars at the Apple Hill Center for Chamber Music in the US. Tekros studied viola at the Conservatory of Prague with Karel Doležal, member and founder of the internationally renowned Doležalovo Quartet, and obtained a Masters in Performance Studies from City University (London) with Arisa Fujita. He also holds a degree in musicology from Masaryk University. During his studies he has been a member of various orchestras and ensembles including the Prague Film Orchestra, the Prague Conservatory Chamber String Orchestra, the National Spanish Symphony Orchestra, the Prague Conservatory Symphony Orchestra, Prague Concert Hall, Italy, France and Spain as well as famous festivals such as Prague Spring. He was also a member of the quartet Iwasaki String Quartet where, among other things, he performed works by modern Czech composers. He attended master classes by Dana Vlachova, Ivan Štraus, Luděk Růžička, Jiri Zigmund, Frantisek Pospisil and others. An important part in his musical education was his teaching in the context of his study at the Conservatory of Prague, under the supervision of Ludmila Štětinová. He has performed solo recitals and chamber music concerts with various artists such as George Georgiou, Valentin Loizou, Veronika Panochova, Petr Chudoba, Prague, England and Cyprus. Since 2013 he has returned to Cyprus where he has been teaching children aged six years. He is also assistant conductor at the Young Cyprus Symphony Orchestra and member of the Commandaria Orchestra and the Cyprus Philharmonic. Mariola Charitidou (piano) graduated from Tbilisi State Conservatoire in 2003. In 2005 she moved in Cyprus and since then she has an active pedagogical and performing career. She leads piano classes in the State Musical Schools of Cyprus and at the private music school Musica Mundana. Her students were awarded in International piano competitions and masterclasses in Cyprus, Greece and Russia. At present she is the pianist collaborator of The Cyprus Symphony Orchestra and The Paphos Aphrodite Opera Festival. So far, she has appeared as an accompanist in numerous concerts, vocal and instrumental masterclasses and competitions such as the 37th International Hans Gabor Belvedere Singing Competition (2018).